Not too long ago, I bought a set of two cute little brown glass spray bottles off of Amazon — 16 ounces, about $5 each — and I have to say, that was a good idea on my part. I have not loved all of the items I’ve bought in an attempt to be zero waste (looking at you, bamboo scrub brushes), but those glass bottles totally give me a lift whenever I use them to clean my house. And that, kids, is why being an adult is stupid. Turns out it doesn’t take much to make a spray bottle. I’ve been tempted to buy another set, but in the spirit of the project, I’ve decided to go another route. 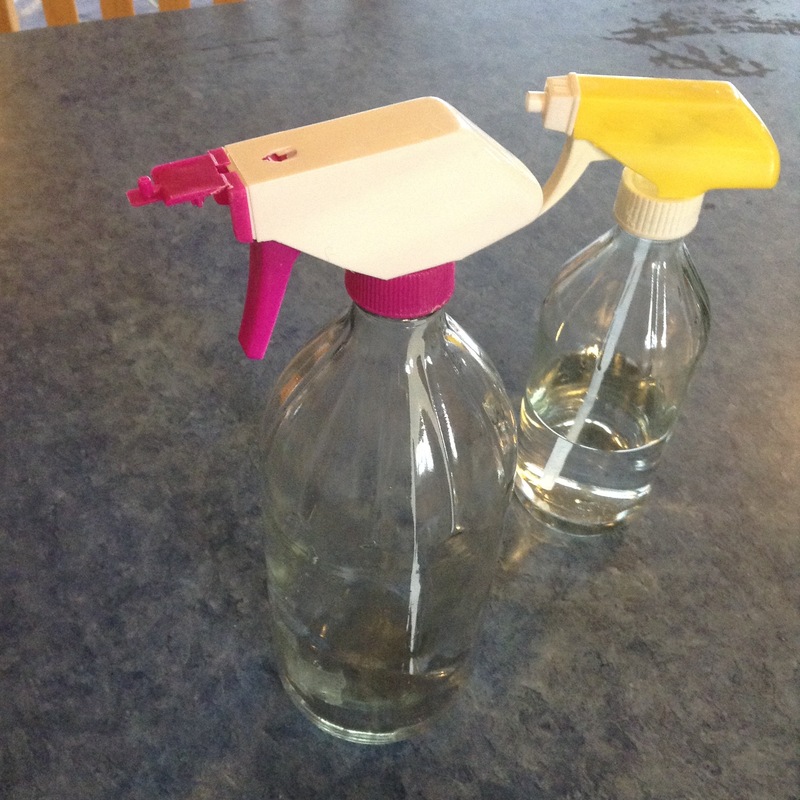 Because apparently you can make spray bottles out of used vinegar jars, as I learned from our friend Bea at Zero Waste Home. She’s used such jars for all sorts of things, from soap pumps to cleaning. I’ve had that little bit of info floating around my brain for years now, but have been blithely recycling those bottles anyway. Sometimes it just takes a while for an idea to take hold. So when I was overhauling the laundry room (um, if by “overhaul” you mean “cleaned out that one cupboard”), I kept the spray nozzles from my various cleaners. For a grand total of two. Well, we start where we are, right? And on Saturday, the day had finally come for putting this into actual practice — I’d used up my small bottle of organic vinegar, Eric had used his large bottle of not organic vinegar, and he’d also brought me a present from elk camp: A Jack Daniel’s bottle he’d gotten from our nephew. I finally had a lot to work with. Attempt #1: Small bottle. I like the size and feel of this thing, as well as its look. I did a quick experiment: Would the spray nozzle from my purchased bottle fit in this one? (I’m kind of proud of myself for thinking it through and testing it out. That’s not really a Trisha trait, to be honest.) It did! 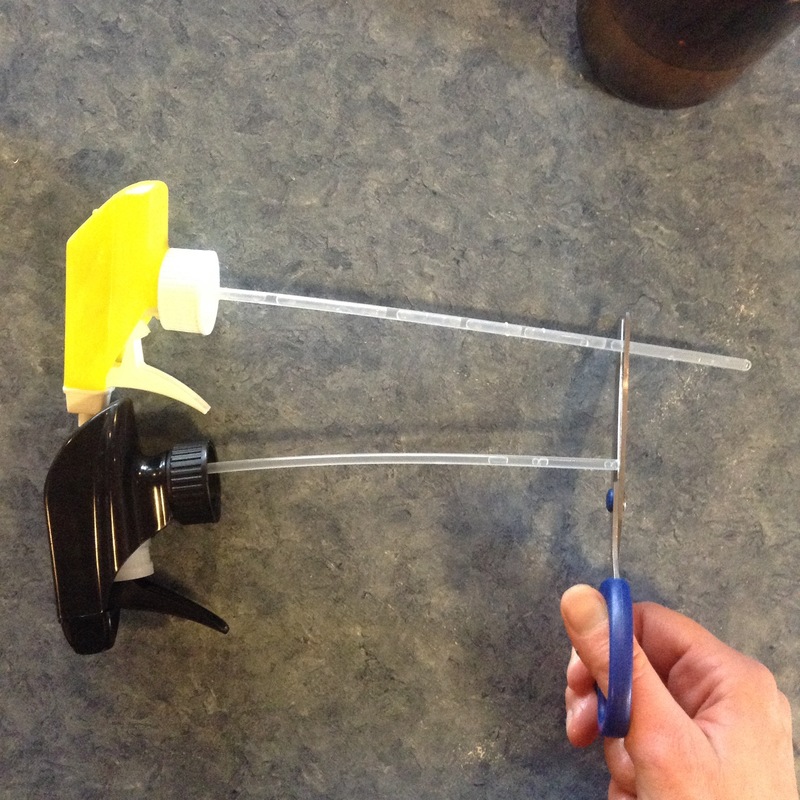 So I carefully cut the plastic straw thing to fit using the purchased nozzle as a guide. 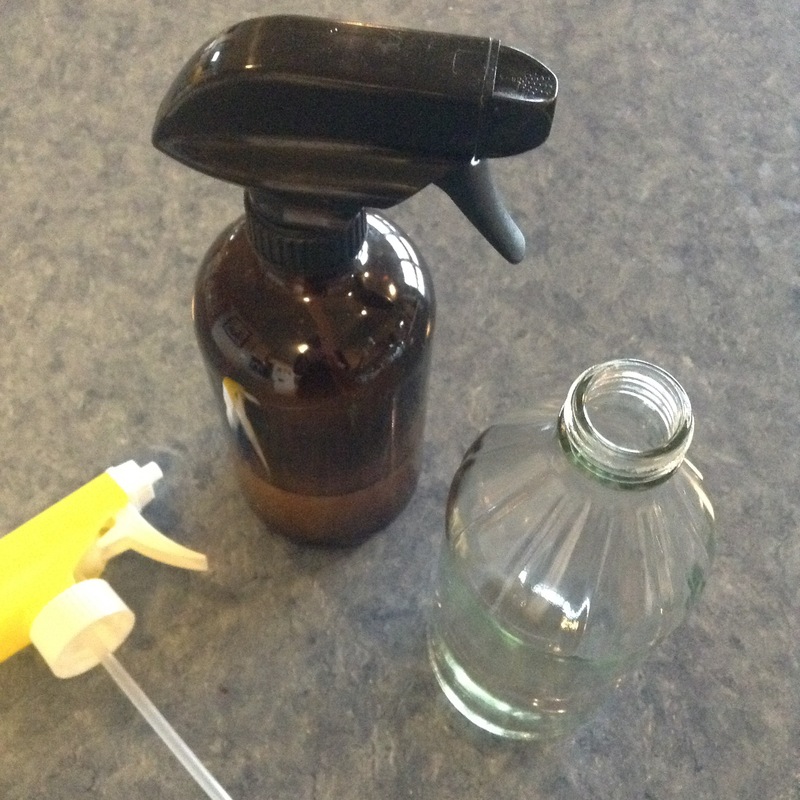 Then I filled my bottle with water and sprayed the nozzle a while until I couldn’t smell any cleaner in it anymore. I’m just using this for a new cleaner, so I wasn’t really worried much about contamination – I just don’t like chemical smells. Having water already in the thing, I decided to save our watershed and simply use that as the start of a basic cleaning recipe found in Bea’s book: 1 cup of water to 1/4 cup of vinegar. Well, mine ended up being 1 1/2 cups of water and a little over 1/3 cup of vinegar. I don’t know, it made sense in my head. Then I tested it on the bathroom mirror. I’m trying to get Eric and Abby off of Windex, and this looked promising. I wasn’t too sure when I sprayed the mixture on and started wiping the mirror — it looked terribly streaky — but as it evaporated, BAM, nice clean surface. Next up was the larger bottle. I wasn’t as happy with that one. The nozzle fit, all right, but it’s heavier — so I can just imagine how heavy it will be when it’s full of squirty stuff — and I wasn’t able to get all of the sticker off, either. I tried everything: soaking in water, soaking and scrubbing with vodka, using a mixture of baking soda and olive oil, running it through the dishwasher … that thing was on there to stay. Eric said he kept the Goo Gone from my first laundry room cull and would let me use it, but I refused on principle, mainly that I hadn’t needed that stuff in all the years we’ve had it (we inherited from Eric’s grandfather after he died … when Abby was 3) and I wasn’t going to succumb now, just because the going was getting tough. Plus, I knew this thing would just end up in the recycling bin. One was free. One was $5. It’s still there, by the way – we don’t have pick up for another week – so if anyone has an idea how to reuse this, let me know. So that just left the whiskey bottle. Step 1: Give ol’ Jack a bath. I wanted to keep the label, because it’s kind of cool, and I like the shape of the bottle even though it’s really too big to use for spraying stuff down. I put soap in it and let it soak overnight, then rinsed it out in the morning. And filled it with white vinegar. I like to add vinegar to the wash when I’m doing towels, and the jar I’ve been using causes a lot of unnecessary splashing. I mean, who cares, it’s vinegar, but this smaller spout should make it easier to pour. Plus the size of the bottle means I won’t have to refill it very often. Although now that I think about it, I could also accomplish that with a bottle of … vinegar. Ah, well. All in all, a highly entertaining exercise. 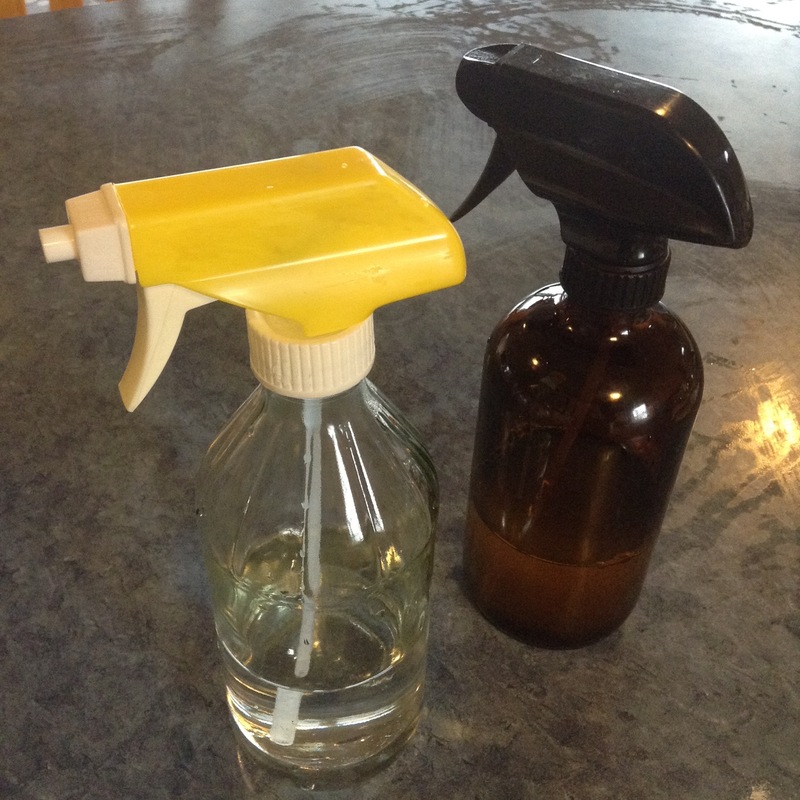 For the record, I put the second saved nozzle back in the laundry room for another attempt later – I just got a new small bottle of organic vinegar that I will eventually turn into another cute little spray bottle. I don’t like that nozzle as well, so if anyone I know in real life is ready to recycle any cleaning products, I want your nozzle, please. She kind of hates us, but I guess if I’d been tossed around to four different places, I would hate life too. Any idea how long it’ll take before she actually trusts us? Poor baby. Next up: I went to a Fill Your Pantry event this weekend – I’ll tell you about that. This entry was posted in reusable containers, zero waste and tagged basic cleaning spray, repurposed containers, reusing spray nozzles, spray bottles. Bookmark the permalink. My husband has used peanut butter to get labels off jars. Spread the peanut butter on the label and let sit awhile, and it should scrub off. After removing the paper label, I use straight olive oil on the leftover sticky residue. I leave it in the kitchen sink overnight and by morning I can remove it easily. Thanks for the tips on the sticky stuff. I have jars I want to use for Christmas gifts, but they’re still sticky. Good luck with your kitty. How long have you had her? It doesn’t seem like it’s been long. It worked! I finally got the goop off the jars I want to reuse! It doesn’t seem like you’ve had her a month. I’m sure she’ll come around, though. Yay! I think it’s very satisfying when the gunk comes off. We got Pearl Oct. 5. I didn’t write about it right away. 🙂 Um, new development, I found a kitten today in the yard. I’m thinking I really messed up and should have left her there — I mean, I know I should have — but … I was afraid she’d get hurt or something. Now I’m afraid I’ve doomed her. She’s probably only 3 weeks, maybe 4. Playful and content but way too young to be away from Mama. I feel sick about it, actually, although it has taken my mind of election night stress. Abby named her Toast. She’s pitch black. Pearl doesn’t seem to be too concerned about the kitten. She’s doing her thing. Oooh, thanks Kathy and Rebecca — I’m going to try those tricks and see if I can get the rest of the glue off. 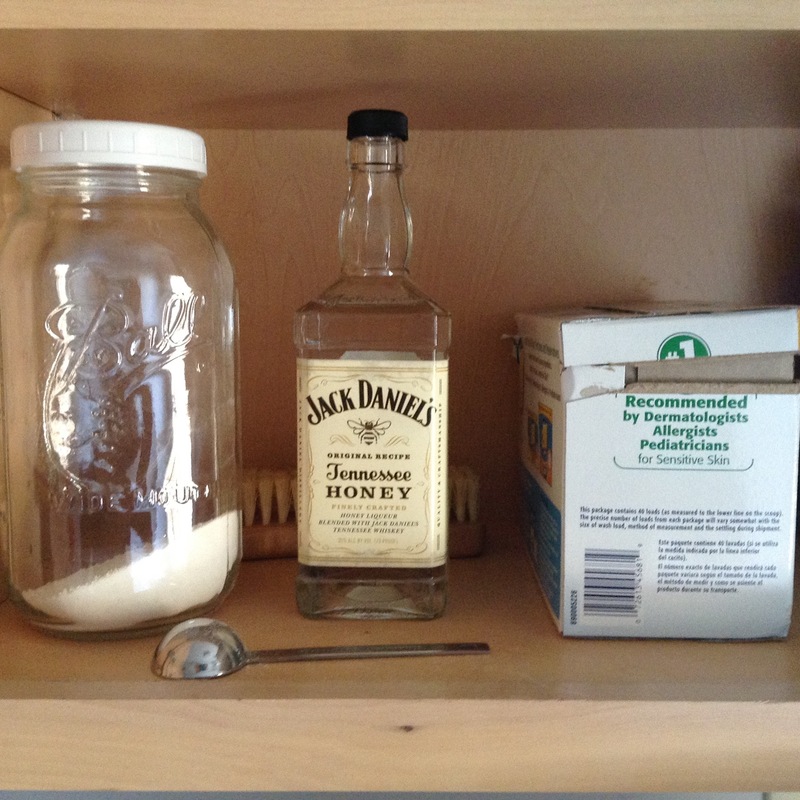 Usually vodka does it, and I’ve had great luck with olive oil and baking soda too. This must be super industrial glue! And it’s been a month, Roberta, since Pearl joined the family. Sometimes I think she’s getting the hang of us and sometimes I wonder if she needs a cat whisperer. 😉 We’re in for the long haul regardless. 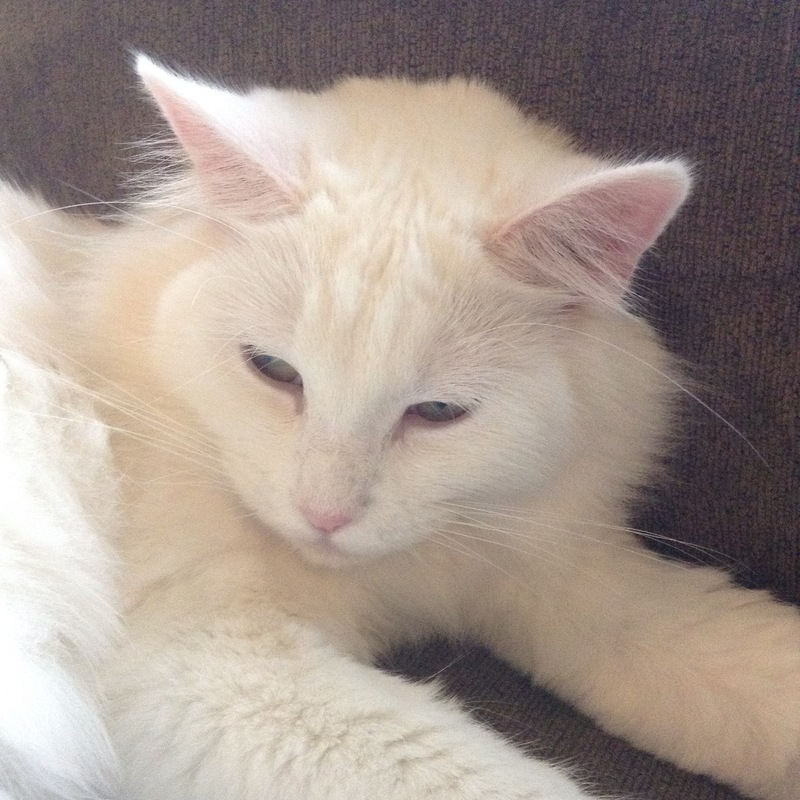 Pearl just needs time, talking to (nicely), love and understanding. Just trust her and she will trust you, keep petting her and she will love you back. Oh Pearl. Last night I was doing yoga and she came up to the mat and sniffed my hand. I was like, aw, she loves me! And then she attacked. Eh, what’s a few wounds? But seriously, yes, we’ll get there. I’m just sad she’s so sad.